My daughter loves it and the quality is great! Enliven a bedroom with this charming comforter set. Featuring a colorful cuddly kitten pattern on the front and solid pink on the reverse, the set provides a playful elegance that's perfect for a child's bedroom. The soft fabric provides plush coziness, and the set is machine washable for easy cleaning. My Grandchildren Love It !!! I was so pleased with the Crayola Purrty Cat comforter set I bought my four year old grand daughter. It is very nice bedding and so cute in person and she loves kittens. I have a bedroom in my house for my two grandchildren a boy and a girl to share. 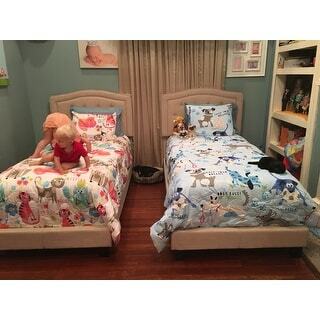 I bought matching twin beds my grandson's is the Crayola Chase your dreams puppy set and my four year old grand daughter has the Crayola Purrty Cat comforter set. They are adorable and look good in the room made for boy and girl. I'm very pleased with both sets just simply adorable. Gave this comforter to my niece. She loved it so much!! Best part is, when she gets tired of the cute cats, it reverses over to a pretty pink solid with stitched hearts on the reverse!!! I got the queen size for my daughter’s bed. She loves the pattern and calls it the kitty bed. The pillowcases are a bit sheer as others have commented—photo shows them with a patterned pillow inside, I don’t find it that noticeable. I’ve had no problems with machine washing it gently (no bunching, no colors bled). The microfiber attracts cat hair and sleeps a little hot but it’s not a problem in our climate and simple machine washing gets rid of the hair. Photo after 6 months use and 2 washes. Easy to smooth out for a neatly made bed look (I’m not a meticulous bed-maker and it looks nice). I got this comforter set my daughter's room. She just loves it. It is so PURRTY and colorful. Perfect for all cat lovers. Such a cute, soft comforter set. Fun, bright colors. I actually purchased this for myself, a self confessed crazy cat lady. I wanted a colorful, cheerful, cat themed comforter set that would match many colors and this fits the bill! I purchased this for my kitty-obsessed 10 year old daughter. She absolutely LOVES it! The comforter is high quality and the perfect weight. The colors are wonderful and the fabric very soft. The sham zips closed which is great and easy. My kiddo couldn't be happier! Tye comforter is very soft, full and colorful! The cute kitty cat design compliments the bedroom nicely. So comfortable and well - made... easy to wash. The colorful print and cute cats are just what little girls love! Not easy to find nice much quilts or comforters with cat prints. This comforters print is really cute but the fabric is very thin- especially the pilllow shams. I don't think this set is worth the money I paid for it. So sweet. My granddaughter just loves. Granddaughter loves it! It is so soft and snugly. 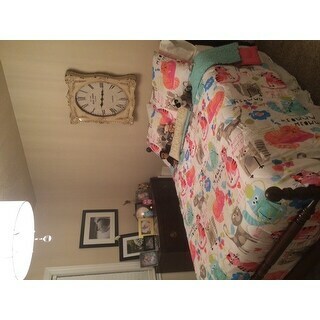 Really love this comforter it’s so soft and the print is so cute my daughter loved it she is six years old And I’m a little bit older but I love it can’t wait to see how the sheets are the matching sheets! My daughter loves cats and the colors jump out at you and makes the room feel so bright! Absolutely love it! My mother was super happy and excited to finally be able to put the comforter on her bed. Of course she likes these kind of patterns. Very soft and durable. I purchased this comforter for my 5 year old daughter and have been very pleased with it. The colors are vibrant and give lots of options for accent colors in her room. It’s held up for too many washes to count. This is a definite buy. bought this for my niece for her birthday. It is very well made and I love the fact the pillow sham/cover has a zipper to secure the pillow in the case. Carries both the Crayola and Hallmark names. Will definitely be buying more. Very colorful, washes well. Daughter loves it! "What do the shams look like that come will the full set?" Print looks the same as the comforter, but with zippers. They look just like the comforter - the cat print on the front and the orangy pink on the back- the set is super cute! "Are the dimensions correct? They show that the twin and the full/queen sizes are exactly the same. Isn't the full/queen larger?" I purchased the full/queen and it measures 90×90. I love it for my daughter's full size bed. It's adorable too! "Is there yellow in this, or is it green? Thanks!" No yellow, the color is a faded lime green. Its very cute. No yellow - it's chartreuse. It's a chartreuse (green/yellow) very much like the crayon pillow in the picture. "Do u have sheets to much the crayon kitty comforter? " You can find the sheets that are displayed in this picture under item# 17513717. The only CUTE kitty (non Hello Kitty), bedding I could find on the www for my soon to be 6 y/o's birthday room makeover!! She is going to LOVE it! !